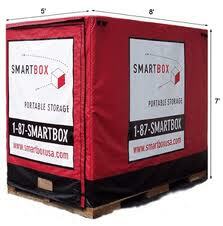 SmartBox is considered to be one of the fastest growing portable storage unit services in the country. They offer both storage and moving services, much like other portable storage unit services. They have added a number of additional services, such as their long distance program to help with long distance moving. With so many options available, it can be difficult to see what makes each option unique, let alone which one is better. Here is a quick SmartBox review to help you decide whether or not they offer the best solution for your specific situation. SmartBox began in 2002 with the goal of providing portable storage and moving services which are better and more reliable than anyone else. The first stores were opened in Virginia and now serves more than 65+ markets across the country, including franchises. Unlike a majority of the options on the market, they provide a single storage unit size (8 feet X 7 feet X 5 feet) that will hold about 1.5 rooms on average. The prices vary greatly based upon the number of boxes you need, how long you will need them, and how far they will need to be transported. One of the biggest benefits of SmartBox is that it is budget friendly. One of the most unique features is that you get to choose a number of different features that can save you money. For example, if you are going to use a SmartBox for storage then instead of having it dropped off at your home, you can use the Dock in Storage feature, which allows you to transport everything to their facility and fill the rental unit without having to pay any delivery fees. Plus, you can still get the SmartBox delivered to your residence whenever you need it, which means you still get all of the benefits of portability without the higher price-tag. Another way that SmartBox is budget friendly is because their boxes are a little smaller than other options, which means that they are less expensive. This particularly useful for people who don’t have a lot of rooms that need to be placed into storage. One of the most unique benefits of using SmartBox is that they offer “the envelope” to make sure that you get everything taken care of. It is actually filled with helpful tools and information to simplify the entire process. It includes packing tips, important phone numbers, and an inventory list to make sure that everything is taken care of and you don’t forget anything. The biggest drawback to SmartBox is the size of the portable storage units. While their smaller size does mean a lower cost, this can also be a problem if you are moving your entire home. While the total cost may still be less expensive, the additional fees (such as the delivery fee) can make up the difference. Overall, SmartBox seems to offer an excellent value for a variety of circumstances. The two biggest benefits are the budget-friendly approach and numerous extras that they include. At the same time, the smaller boxes can be a problem depending on how much you have to move. There is a good chance that SmartBox will be towards the top of your list, however it all comes down to your circumstances. Read more moving container reviews.